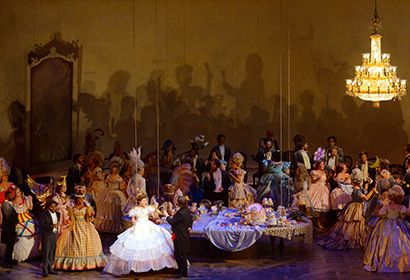 Verdi’s La Traviata is a new production. Coproduction of Lyric Opera of Chicago, Houston Grand Opera, and Canadian Opera Company. 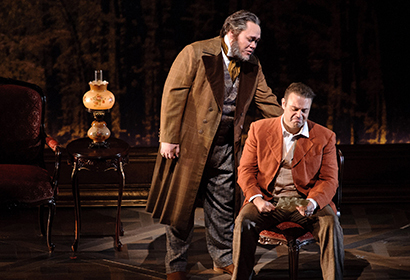 Profoundly moving and emotionally overwhelming—Verdi’s music says it all in this lush new production. Violetta is the most desirable courtesan in Paris. Sought after by society’s most important men and wealthy in her own right, she is perfectly content—until she falls in love with Alfredo Germont. But when Alfredo’s father insists that she’ll ruin Alfredo’s family name, she selflessly pushes away the only man she’s ever loved. Will they ever be together again? Yes, but by then it’s much, much too late. A new production from Arin Arbus, called “a star in the making” by The New York Times. 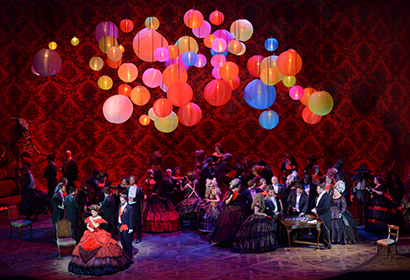 New Lyric Opera production of Giuseppe Verdi’s La Traviata generously made possible by the Julius Frankel Foundation in honor of Nelson D. Cornelius, Stefan Edlis and Gael Neeson, Sylvia Neil and Daniel Fischel, and Helen and Sam Zell. 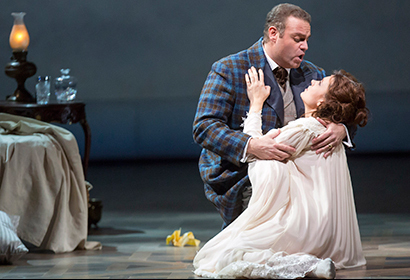 In Italian with projected English texts.Verdi’s La Traviata is a new production. Coproduction of Lyric Opera of Chicago, Houston Grand Opera, and Canadian Opera Company. A party is in progress at the Paris home of a beautiful courtesan, Violetta Valéry, who only recently has revived from serious illness. Gastone de Letorières introduces her to Alfredo Germont, his friend from the country. 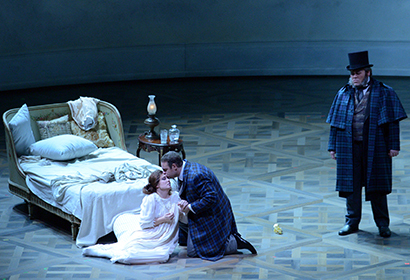 Violetta’s current lover, Baron Douphol, is irritated with Alfredo because during Violetta’s recent illness, Alfredo came to her home each day to express his concern. Gastone encourages Alfredo to lead a drinking song (Brindisi: Libiamo ne’ lieti calici). The guests move into the next room for dancing, but Violetta, feeling faint, stays behind. She is startled by the reappearance of Alfredo and gently rebuffs him when he declares his love (Duet: Un dì felice). Finally she gives him a flower, telling him to return when it has faded. Overjoyed – since this means he will see her the next day – he leaves, followed moments later by the other guests, who affectionately bid their hostess goodnight. Violetta wonders if Alfredo offers the true love she thought would never be hers (Aria: Ah! fors’è lui). She laughs off the idea, declaring that her life will remain a whirl of pleasure (Cabaletta: Sempre libera). Five months later Alfredo is blissfully happy living with Violetta in the country, far from Paris society (Aria: De’ miei bollenti spiriti). When Alfredo learns from the maid, Annina, that Violetta has been selling her possessions to pay their expenses, he rushes off to Paris to raise the necessary funds (Cabaletta: O mio rimorso). Violetta is perplexed by Alfredo’s sudden departure. She receives an invitation to a party to be given by her friend, Flora Bervoix, that evening in Paris and quickly dismisses it. 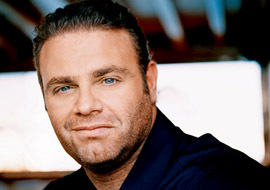 A visitor arrives: Alfredo’s father, who is outraged by his son’s liaison with Violetta. She responds that she is a lady and will not be insulted in her own house. Germont insists that Violetta give up Alfredo for the sake of his family: Alfredo has a sister whose chances for a prosperous marriage would be doomed by Alfredo’s relationship with Violetta. Having assumed that Violetta is after his son’s money, he is surprised to see that she loves Alfredo unselfishly. She is eventually convinced by Germont’s appeal and agrees to leave Alfredo (Duet: Dite alla giovine), knowing that it will hasten her death. Germont urges her to live and attempts to console her with the thought that heaven will reward her sacrifice. He embraces her and leaves. Violetta decides to go to Flora’s party that night and writes a farewell note to Alfredo. When he returns, she begs him simply to love her as much as she loves him and then runs from the room. The confused Alfredo is surprised when a messenger delivers the farewell note from Violetta. He reads only a few lines before despair overwhelms him, but his father appears and offers comfort. He begs his son to return to the family in Provence (Aria: Di Provenza il mar), and urges Alfredo to seek solace in their embrace (Cabaletta: No, non udrai rimproveri). Noticing Flora’s invitation, Alfredo assumes that Violetta has returned to her old life – and to her old lover. He resolves to seek revenge at the party. At Flora’s home, everyone enjoys vigorous Spanish entertainment (Chorus: Noi siamo zingarelle). Alfredo startles the guests by arriving without Violetta. She soon arrives, escorted by Baron Douphol, who battles Alfredo at the gaming table. Alfredo wins every game and large sums of money. When supper is announced, all adjourn to the dining room, but the distraught Violetta soon reappears, having asked to see Alfredo privately. Fearing Douphol’s jealousy, she begs Alfredo to leave immediately. He refuses, finally drawing from her a false confession that she loves Douphol. Summoning the guests, Alfredo humiliates and denounces Violetta and throws his winnings at her feet as payment for her services. She faints, to the horror of all present, who castigate Alfredo for his behavior. Germont, who has followed his son to the party, reproaches him for insulting a woman, even in anger. 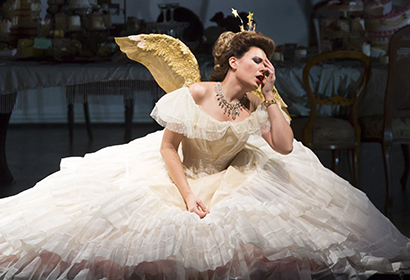 Now revived, Violetta laments that Alfredo will never understand the sacrifice she made for love (Ensemble: Alfredo, Alfredo). One month later, Violetta lies dying in her Paris home. Dr. Grenvil encourages her, but admits to Annina that Violetta has only a few hours to live. Violetta asks Annina to distribute her remaining money to the poor. Left alone, she rereads a letter from Germont: Alfredo, having wounded the baron in a duel, is traveling abroad. Germont has written him of Violetta’s sacrifice, and Alfredo – accompanied by his father – will soon return to ask her forgiveness. Violetta knows that it is too late (Aria: Addio del passato). Annina reappears, asking her mistress if she feels well enough to hear some unexpected, joyous news. Within seconds Violetta is in Alfredo’s arms. He convinces her that she will regain her health once they start life together again, far from Paris (Duet: Parigi, o cara). Violetta wishes to go to church to offer a prayer of thanksgiving. She attempts to dress, but her energy is gone. In anger and despair, she asks how God can let her die so young. When Germont arrives, he is horrified to see Violetta in such terrible condition. She gives Alfredo a miniature of herself in happier days, and asks that he give it to the woman he will one day marry (Finale: Prendi, quest’è l’immagine). Violetta suddenly declares that she has found new strength, but then falls lifeless. 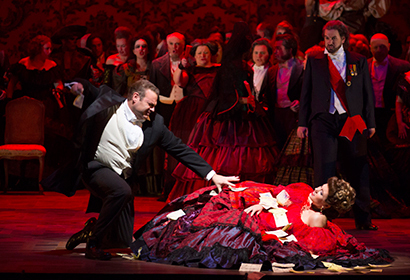 How have you immersed yourself in the story, the music, and the backstory of La traviata? I started working on it about a year ago. It was fascinating to read both the Dumas fils novel and his play, to see what Verdi and his librettist, Francesco Maria Piave, were working from and to make note of the things they changed. I also read about Marie Duplessis, the courtesan Dumas fils fell in love with, who was the inspiration for his novel. Because the opera rests so deeply upon 19th-century bourgeois concepts of morality, it has been important for me to gain an understanding of the values of the world that Verdi is depicting, and to understand the life and trade of a Parisian courtesan of the time. There really isn’t an equivalent in our world – certainly it’s very different from our contemporary understanding of prostitution. I actually think that’s one of the aspects of the opera that is most challenging to convey to contemporary audiences. But it’s crucial – Violetta’s shame and her precarious financial situation are at the crux of the dramaturgy. All the history and backstory goes into the stew of my imagination, but ultimately one has to simply focus on the opera itself. The music reveals the story in an incredibly specific way, and that is of the greatest interest. What draws you to this opera? The music. The story, which depicts a beautiful love destroyed by a petty and cruel world. I love the intimacy and the intensity of the piece, the tragedy of it, the poetry within the music, the ways the melodies are woven through, the passion expressed by the characters. And I love Violetta’s fierce thirst for life in the face of death, her self-loathing, her loneliness, the wild parties. How do you keep the opera’s timeliness/timelessness without transposing it into a current setting? For me, it’s not the setting that makes something relevant to an audience. I have seen many plays, operas, and films that were set in our contemporary world that had little relevance or power, just as I have seen many period pieces that speak to me directly and feel of the moment – and vice versa. The setting is not the determinant, it’s just the surface. It’s the immediacy and truth of the characters, their situations, the imagery, language, music, ideas, themes, and passions that make a piece timely and profound. In this case, we’re setting La traviata around the time that Verdi wrote the opera, as it was originally conceived, because the circumstances surrounding Violetta are incredibly specific. To move it out of that time, I feel, would change or lower the stakes. What intrigues, moves, and/or frustrates you about the three central characters? Violetta is a successful courtesan, a girl who is dying. She is lonely, sad, theatrical, practical, passionate, so filled with longing. She knows how to throw a great party. One of the big questions is: why does Violetta agree to break it off with Alfredo? Why does Germont get to her? It’s one of the mysteries of the piece. I think she believes that a courtesan, a fallen woman, doesn’t get to fall in love. She cannot escape her past. She knows better than to fall in love, but does it anyway. She sacrifices her one shot at love and happiness because she believes she doesn’t deserve it. She has digested the values of her world and has come to believe that they are correct. That’s what destroys her. Alfredo comes from a sheltered, conventional, bourgeois world. He is adventurous. He comes to Paris and is knocked out by this remarkable woman – he’s never met anyone like her. He loves, despite the expectations of his family and the world. How brave! He is naïve, impulsive, inexperienced, has a temper, is a rebel. The thing that frustrates me about him is his foolishness when it comes to money. I don’t understand why it doesn’t occur to him that Violetta is paying their way in the country. 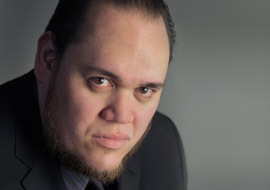 Germont is a sinister figure in the opera, but he’s actually a very ordinary, familiar, bourgeois family man. That’s what makes him so dangerous – he thinks he knows what’s best. He represents the moral conventions of 19th-century Paris and probably 19th-century Italy. Surprisingly, he comes to love Violetta. How do you envision the chorus’s role? 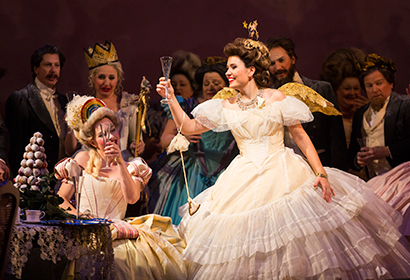 In a certain sense La traviata is a story about profane love – a love that is a kind of rebellion against the world. Germont reveals the values of the world Alfredo rebels against, while the chorus reveals the world from which Violetta tries to escape. Her life as a courtesan is one of excess, debauchery, empty pleasure, superficiality, and disease. The chorus must convey this. What are the inspirations for the visual world you’re creating with your collaborators? Here are some images that come to mind: a frail girl putting on a big dress, brightly colored damask wallpaper, a man in a woman’s wig, bull heads, skeletons, Spanish lace, iridescent bird wings, colored paper lanterns, dancing shadows, Ingmar Bergman’s figures on the horizon from The Seventh Seal, sunlight breaking through the trees, pastel colored cakes, carnival parades, 19th-century Parisian interiors, daguerreotypes, white plaster walls, confetti…. This entry was posted in Music, OPera and tagged Alfredo, Chicago, Chicago Sun-Times, Giuseppe Verdi, La traviata, Lyric Opera of Chicago, New York Times, Verdi. Bookmark the permalink.